You’ve got Mrs Smith next door and the family across the street who you sometimes babysit for, and need something else in case one of the other neighbours pops in over Christmas. Find suitable gifts for your neighbours can be one of the most challenging purchases you’ll make this month. Let’s relax a little and look at the options out there. First up is this absolutely stunning winter spice bouquet from Marks and Spencer. A velvety combination of rich red and orange hues scented with cinnamon eucalyptus evokes the flavours of mulled wine – just perfect for this time of year. M & S also offer a delivery option on this type of bouquet so you could opt to have it delivered through the mail in case you don’t catch up with them over the festivities. It’ll be £35 worth spent, as Marks take great care in the preparation and packaging of their flower ranges, it’ll be lovely to watch the buds open up and bloom throughout Christmas. I reckon you will be the favourite neighbour in the street after giving this heart-warming bouquet which is bound to light up anyone’s face this Christmas. For something a little different I really liked these LSA glass candle holders. They come in different colours so you could adapt for the colour scheme of your neighbours home. At only £16.50 from John Lewis these contemporary pieces will be on show all year round. Handmade in Poland, peacock coloured soda lime glass has been encased within clear glass giving a striking bold effect. The bud vase is designed to enhance single flower stems or small posies while the tealight candle holder will create ambience in any room. Its lovely to see this duo sitting next to each other, or you have the flexibility to separate them and spread across different rooms. 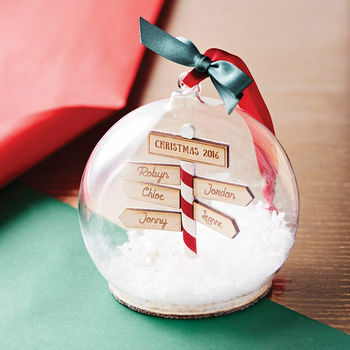 For a family gift look no further than this personalised Christmas sign post bauble. It’s a gift that can be treasured for years to come and can proudly hang each year on the family tree. Don’t worry it’s really easy to order – just click onto notonthehighstreet.com and use the step by step guide to complete the artwork. The delicately constructed winter snow scene is enclosed in a clear glass bauble and hung on a festive satin ribbon. The miniature directional signpost stands on a candy-cane pole with arrows identifying the family members whose name are carefully engraved with your choice of wording. It’s really nice that you can select your preferred choice of hanging ribbon too. You can add two to six names so it’s perfect for adding pet’s names or grandparents too!